Sharing music with friends used to be a real hassle. In the time it took to connect your phones and transfer the files, you might as well have made each other a C90 mix tape! But with Group Play pre-installed on the Samsung GALAXY S4, tuning in to your friends' tunes couldn't be simpler. Group Play uses Wi-Fi Direct technology, which creates a personal Wi-Fi network for you and your buddies. All it takes is for one of you to tap on the app, create a group and then choose a password (because you don't want to share with the whole world). You now have a 'master phone' – and a gateway to a world of sharing. Once the master phone is enabled, simply tap another GALAXY S4 to the back of it, and the devices will synchronise using NFC, giving instant access the group. 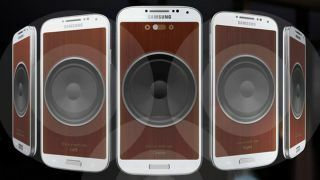 You can share your music across four other GALAXY S4 devices simultaneously, while continuing to use your smartphone's other impressive features normally. The master phone can not only control what you all listen to, but also how it sounds on each connected device. So if you're having a house party with an S4 in every room, it's easy to set appropriate volume levels for each one. With all the handsets dotted around one room, you can even set up a finely tuned surround-sound system! And of course, sharing works equally well with headphones, so you can all enjoy the same music on the move without attracting the ire of other people in the vicinity! With Group Play on the bus or train, every trip becomes a silent disco, and having your earbuds in doesn't have to mean an antisocial journey! However you and your friends choose to listen to your tunes, once you've got a network going, there's no need to stop at sharing music, either. With Group Play enabled, you can also control photo slideshows across devices, jointly edit pictures and documents, and play multiplayer games. How's that for social networking!